crinklynose.com: Whatever Happened to the Philippines? Whatever Happened to the Philippines? 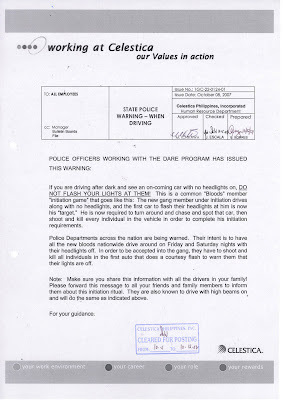 Today I got an email from my DLSU-ECE batch yahoo group about this disturbing "Gang" thingie going on sabotaging motorists in the Philippines. car's rear passenger side, grabbed the car's antenna and broke it. to get down and confront him. easy prey. I shall call 117 again. I suggest you do the same. Although I don't know if that would really help. cars naman. I don't know kung may nabuksan sila. Then yesterday, while the PMAP rally was going on along Buendia cor. DAYLIGHT! WITH A POLICEMAN AROUND! Hay, what the world has come to. mga tsong this really happend last wednesday, September sept.
or just spread this news.... its for all us naman eh... peace! Ingat kayo when passing through south super highway cor quirino ave.
through south superhighway all the way to nagtahan. yeah, nakakalungkot na it's like this back home. but you know what? i think thigs like these happens in every big city. here in new york nga, a few weeks ago at a jewelry store in the jewelry district in manhattan, on broad day light, robbers started smashing the display windows with jackhammers. they ran away with jewelries worth $300,000. i don't know but i haven't heard of a broad day light robbery in a store back home. the robbers are gutsy. mikka's mom, sweepie's cupie, mamsy's balotskie, loves to laugh, loves her family, loves her dogs, loves computers, mac aficionado, internet junkie, edits videos for fun, a right-brainer gal with a left-brainer job, geek married to another geek, chocoholic, bossy at times, grumpy when hungry, eager beaver, wanna travel, hopeless romantic, hates shopping, hates wasting time in front of the tube, would love to join a skating marathon one of these days.